Fifty years after our first Dollars for Scholars chapter was established, the cost of college tuition has far outpaced the rate of inflation, making the dream of earning a degree beyond the grasp of many families. As student loan debt continues to climb, the work Scholarship America is doing today has never been more important to helping offset the cost of tuition for college students. We believe that Scholarship America’s 50 years of experience as a national education leader implores us to lend our voice in the national dialogue regarding the future of postsecondary education. As part of our effort to turn this vision into a reality, Scholarship America is one of dozens of organizations that have joined the “Higher Ed, Not Debt” Campaign, a multi-year year campaign dedicated to tackling student loan debt in the United States. 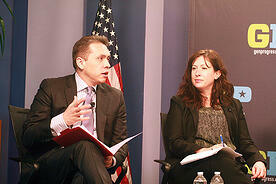 Max Espinoza, Senior Vice President, Education Programs and Policy, was invited to represent Scholarship America on a panel of four nonprofit organizations at the national launch event earlier this year. In his remarks, Max highlighted the work Scholarship America is doing in supporting students’ postsecondary goals through private scholarships. By participating in the “Higher Ed, Not Debt” Campaign, Scholarship America is engaging in one of the most critical higher education issues of our time. In turn, the organization will help get more students to and through college – with little to no debt upon graduation. The Student Volunteer Award (SVA) is Scholarship America’s way of honoring students who embody the volunteer spirit of Dollars for Scholars. Twenty exceptional students receive $1,000 scholarships, with the national winner earning a $1,000 renewable award for up to four years. Scholarship America staff believe in the organization’s mission to help students succeed through postsecondary education, and staff fundraisers are held throughout the year to help support the great work that the organization is doing. 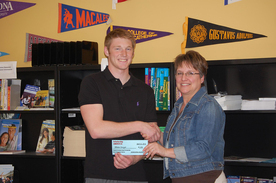 Last year, employees raised enough money to provide four students with Student Volunteer Award scholarships. Read about our Student Volunteer Award recipients here. 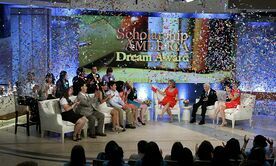 Scholarship America’s first class of Dream Award recipients has been selected and were announced on Katie Couric’s daytime talk show, Katie, on May 23. Scholarship America was able to award more than $150,000 in renewable scholarships to our recipients this year through the Dream Award. Fundraising to support Scholarship America’s Dream Award was spurred by a generous donation from Katie Couric of the proceeds of her book. Five highly-respected education professionals joined Scholarship America’s president and CEO, Lauren Segal, to select the inaugural recipients of the Scholarship America Dream Award. Watch clips from Katie here. In 2012, Carmen Gil was selected to receive a $25,000-per year scholarship from the Buick Achievers Scholarship Program, one of the largest scholarship programs in the country, which is funded by the General Motors Foundation. As a first-generation college student working and attending classes full time, the award would allow Carmen to continue her STEM education, worry-free. It was students like Carmen that prompted the GM Foundation to start the Buick Achievers Scholarship Program in 2011. Although the GM Foundation was already invested in a number of educational initiatives, especially K-12 programming, creating a scholarship program focused on higher education would be a new endeavor. The GM Foundation recognized the need to run a robust program, and called upon Scholarship America’s Scholarship Management Services (SMS) division for assistance. SMS, which manages more than 1,300 programs for corporations, individuals and foundations, offered the expertise that the Foundation was looking for in administering an education assistance program.